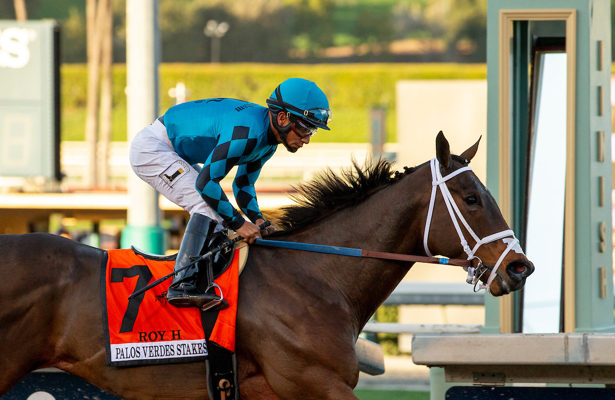 The two-time Breeders’ Cup Sprint champion enhanced his gaudy resume Saturday with a four-length romp in the Palos Verdes Stakes (G2), winning it for the second straight year, this time in a glittering six furlong time of 1:08.89, earning a 109 Beyer Figure. A son of English Channel out of the Unusual Heat mare Phi Beta Heat, Rye remains a full horse at age 6. He won the Classic by a head last year under Kent Desormeaux, who will be aboard again for the nine furlong grass test on Saturday. Rye worked five furlongs Sunday in 1:01.80. He also plans to enter Our Silver Oak in Saturday’s $100,000 California Cup Turf Sprint Stakes for 3-year-olds at about 6 ½ furlongs on turf. Drayden Van Dyke rides Our Silver Oak, while Rafael Bejarano will be on Takeo Squared for Doug O’Neill and Edgar Payeras aboard Teacher’s Treasure for Eddie Truman in the race. First post time for a pair of 10-race cards Sunday and Monday is noon PT. Approximate post time for Sunday’s fifth race, leg one in the Rainbow Six, is at 2:03 p.m.
For additional racing information and specifics on Santa Anita’s 20-cent Single Ticket Rainbow Pick Six, please visit santaanita.com or call (626) 574-RACE. FINISH LINES: Undefeated Breeders’ Cup Juvenile winner and soon-to-be Eclipse Award champion as outstanding 2-year-old male of 2018 Game Winner worked four furlongs for Bob Baffert Sunday morning in 48.60. The son of Candy Ride is ticketed for the San Felipe Stakes (G2) on March 9. Santa Anita clockers had a busy morning as there were more workers than blond anchors on Fox, with 312 recorded drills, including 51 on the dirt training track, and one on the turf, that by Richard Baltas-trained Next Shares who goes in the $7 million Pegasus Turf Cup Invitational at Gulfstream Park Saturday. Next Shares went four furlongs on a firm course in 49.20. Leading rider in wins and money won this meet (19 and $1,232,346) Flavien Prat will be absent Friday and Saturday, traveling to Florida the first day and riding Audible the second in the $9 million Pegasus World Cup for Todd Pletcher. Congratulations to Anna Meah on her first training win yesterday, sending out favored Stringent under Rafael Bejarano to capture the fourth race by a half-length. “It felt great,” Meah said. Today’s fifth race features six first-time starters among the field of seven 3-year-old maiden fillies, two (Blue Moonrise and Jon White’s 4-5 morning line favorite Flor de La Mar, both trained byBaffert) fetching $500,000 each at the Fasig-Tipton sales. Overall, the seven cost $2,260,000, an average of just over $322,857 each. Tomorrow, Martin Luther King Jr. Day, will be Dollar Day at Santa Anita, with beer and soda on sale for a buck and hot dogs for $2. First post time will be noon.